First it was her clothing. Then it was her lack of money. Now America’s youngest-elected member of Congress, Alexandria Ocasio-Cortez, is copping criticism for announcing she’s taking a few days off for “self-care” before entering Congress next year. While getting “raw and honest” on Instagram this week, the 29-year-old confessed she’d been so busy campaigning for the midterms that she’d neglected herself. “Before the campaign I used to practice yoga three to four times a week, eat nutritiously, read and write for leisure,” she said. So before being sworn in in January, the congresswoman-elect said she’d be taking some time off to relax and focus on herself. “I believe public servants do a disservice to our communities by pretending to be perfect,” she said. 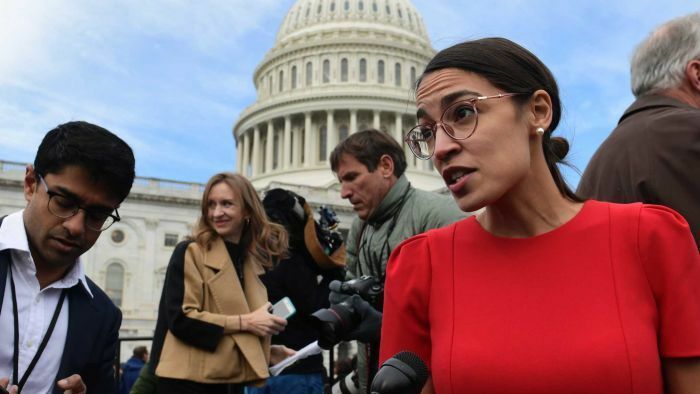 Since making the announcement, some US media networks and politicians have questioned how Ms Ocasio-Cortez could “already” need time off if she hasn’t officially started the job. “She’s not even in office yet, but Representative-elect Alexandria Ocasio-Cortez already needs a break,” a Fox and Friends news report began. Others said she was a “typical millennial”: lazy, entitled and arrogant. “Unemployed bartender living off donor money needs a vacation before living off taxpayers,” media personality John Cardillo said. “Plenty of people living in socialist countries wish they had a job from which they could take a break. The arrogance and ignorance of this Congresswoman-elect is stunning,” blogger Matt Rooney tweeted. Ms Ocasio-Cortez said self-care was a political issue for many people in America, who are criticised for spending money on themselves while struggling to make ends meet. “For working people, immigrants, and the poor, self-care is political. Not because we want it to be, but because of the inevitable shaming of someone doing a face mask while financially stressed,” she said. But she said she also wanted to challenge the expectation that workers need to be “superhuman”. “No-one in Congress is superhuman — I’ve seen it myself,” she said. In Australia, a recent women’s health survey found one in three women felt they didn’t get enough time for themselves on a weekly basis. Janet Michelmore, the executive director at Jean Hailes, said it was something that needed to change. “Self-care is not selfish. Our aim is for everybody to be aware that looking after yourself is important,” she said.